Finally making it to one of the most desirable cities of the list of my less travelled areas in Spain, I start with Burgos for now. Although we landed in Santander, the nearest airport, we made our way to Burgos straight after leaving the chance open if time permitting for Sunday, to return to Santander after many years since the last time. That I can recall I’ve only been once to Burgos when I was too little to even remember anything other than a huge Gothic cathedral and all black because of centuries of dirt. Many years have passed and of course, the cathedral is not black anymore, but spotless clean and fully restored after many years of ongoing works. Nothing else I did remember from the past, nor even a picture I have, so this trip was as exciting as for any new city I visit from scratch. While there are many cities in Spain as beautiful and historical as Burgos, what makes it to stand out is the impressive cathedral, listed UNESCO World Heritage Site for its fine pure Gothic architecture, size, achievements, ornamental details and massive collection of art in every form inside and outside, with stunning glass works all over. There is such another cathedral with similar characteristics in Leon, northwest Spain, which to my taste (and not because I was born there), is more beautiful yet it does have a mix of architectural styles being Gothic the primary one. At the footsteps of the historic old town at little over 15 kilometres lies another site, this time unique in Europe and of high importance to the world. The Atapuerca caves, home to the richest fossil record of the earliest human beings in Europe, from nearly one million years ago and extending up to the Common Era. Only for having the chance to come and visit this place on a guided tour, your trip to Burgos will be well worth it! And in combination with such a beautiful old town, you are guaranteed to have an unique city break. The city itself is small, with a very compact historic quarter, majority of which entirely pedestrianized. While the old town lies to the north of the Arlanzón River, to the south are the newer districts and few of the key sights not to be missed. All in all it is an easy walk everywhere within the city and a day will be well enough to enjoy absolutely everything without any rush. If you do not have a car with you, then get a bus to both the Monastery of the Royal Retreats and the Miraflores Charterhouse because they are farther from reach, and walking is not optional. Wherever you go in this city you have part of the history of Spain, from the 4 kingdoms that once were to the unified Kingdom of Spain. Burgos was the capital city of the Kingdom of Castile, one of the most powerful and rich in the peninsula, therefore expect to find mansions and palaces, fine carved marble kings and queens, prince and princesses burial tombs; richly decorated churches, some of which home to masterpiece of altarpieces gilded with the gold that came from the first shipment from the New World upon its discovery and plenty more. There would not be Spain as we know it today without Burgos. Coming to food subject that’s another of the highlights. Not only about the many tapas bars everywhere in the old town, notably Calle San Lorenzo which is the best, but the many traditional restaurants anywhere, with very reasonable prices. Hardly you will see a tourist trap or overpriced places. Make sure to try the blood pudding so famous in Burgos, here they do it with rice and its delicious. Stews with legumes is also very popular and so are the hearty and meaty grills. I can recommend you Meson de los Infantes as a good restaurant serving you this traditional dishes, and believe it or not from its location meters off the Cathedral Square, it is not overpriced, has a great service and quantities are big not to mention the good quality. 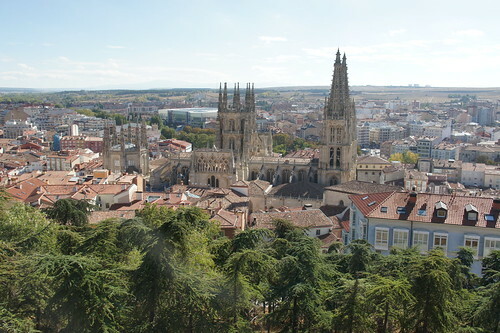 For more information about Burgos check Wikipedia and Wikitravel sites. Spain’s currency is the Euro (EUR). Please note that any price reference is true as from when this guide was created, therefore check prices in advance as with the time they change. North of the city Right by the edges of the historic old town, the original settlement of the city with its castle. -Parque del Castillo The hill with the remains of the castle is now a great park with the best vantage viewing point of the whole city down below, noteworthy the cathedral. -San Esteban Arch At the northeast of the Parque del Castillo, is one of the medieval gates from the former city walls giving direct access to the old town. Old Town Small in size yet very compact, it retains majority of its medieval layout with plenty of historic churches, convents, palaces and houses. -Saint Esteban Church Right at the bottom of Parque Castillo at the edge of the old town. Built from the 13th century in Gothic style, it is the museum of the altarpiece. -Way of Saint James The main street through the length of the old town is the famed way to Santiago de Compostela. Its entire length is an UNESCO listed site. -Cathedral The sight number one in the city, a Gothic masterpiece built between the 13th and 15th centuries, listed an UNESCO World Heritage Site. Its facades, main towers and octagonal tower are the most remarkable silhouette. Don’t miss inside the tomb of Castile’s most celebrated national hero, El Cid and his wife Doña Jimena. It costs 8 Euros to enter, 6 with a student card. -Santa Maria and San Fernando Squares Both squares by the sides of the Cathedral offer great views to this, and the many old surrounding buildings. -Arch of Saint Mary Another of the medieval gates in the city, built in the 14th century. It is by one of the corners of San Fernando Square towards the river. -Santa Maria Bridge One of the most beautiful in the city across the Arlanzón River. The views from the southern end towards the Arch of Saint Mary and the Cathedral towering behind is one of the most known. -Paseo del Espolon The northern banks of the Arlanzón River between the Satan Maria and San Pablo Bridges is a great and beautifully landscaped garden and walkway offering great views at both sides. -Municipal Theatre At the eastern end of Paseo del Espolon is the main theatre of Burgos, dating from 1858. -San Pablo Bridge Another of the main bridges over the Arlanzón River marking the eastern edge of the old town core. -Museum of the Human Evolution Opened in the year 2010, it is one of a kind in the world. Built on the banks of the Arlanzón River just by the south side of San Pablo Bridge, houses the greatest collection of human fossil finds in the world from the nearby Sierra de Atapuerca. -El Cid Square By the northern side of San Pablo Bridge, named after the most celebrated national hero who was born near Burgos. -Plaza Mayor Few meters to the northwest from El Cid Square is the main square in the city since medieval times. Few Mayor Squares in Spain are of many different shape sides and not perfectly square or rectangular as its typical. -Plaza del Huerto del Rey Just two streets ahead from Plaza Mayors, it’s shaped as a long rectangle. -San Lorenzo Church Built between 1684 y 1694 in Baroque style it has great interiors and a beautiful altarpiece. South of the city Across the river, not far southwest of the city there are great sights not to be missed for their history and architecture. -Monastery of the Royal Retreats (Monasterio de las Huelgas Reales) Founded in 1180 by king Alfonso VIII in a pre-Gothic style, has the most elaborate and beautiful cloisters unparalleled anywhere else in Europe at the time. It’s been the site of many royal weddings such as Edward I of England to Eleanor of Castile in 1254; the birthplace of King Peter I of Castile, and royal burial of many kings of Castile. It’s located south of the river. It costs 8 Euros to enter, 6 with student card. -Hospital del Rey – University Located to the south of the city, west of the Monastery of the Royal Retreats and right along the Way of Saint James, was founded by King Alfonso VIII in 1195 as a shelter for pilgrims. The Hospital itself was built during the Renaissance, and nowadays are the main buildings of the University of Burgos. -Romeros Gate The main entrance to the campus and symbol of the University. The arch is decorated on both sides with Jacobean-era references, and the portraits of the founders, Alfonso VIII and Queen Eleanor. -Patio de los Romeros The main courtyard with the Hospital’s church as centrepiece, the House of Sacristans (Dean of the School of Law), and the Rectorate buildings. -Miraflores Charterhouse (Cartuja de Miraflores) At 4 km southeast from the historical centre of Burgos, by the Arlanzón River, this Carthusian Monastery was built between 1453 and 1484 in later Gothic style. It houses two gems: the marvellous burial tomb of kings John II of Castile and Isabella of Portugal, and the main altarpiece that was carved in wood by artist Gil de Siloé between 1496 and 1499, polychrome and gilded by Diego de la Cruz with the gold that came from the first shipments of the American continent after its discovery. There is no entrance fee. Outside of the city The large amount of historical sites everywhere near Burgos and its region could keep you busy for some days. Castles, monasteries, ancient cities, nature. Everything on the doorstep. However, among every place there is one unique in Spain and pretty much in Europe at such huge scale. This is the Atapuerca archaeological park, at only 17 kilometres to the east of the city. -Sierra de Atapuerca The caves are home to the richest fossil record of the earliest human beings in Europe, from nearly one million years ago and extending up to the Common Era. Listed UNESCO World Heritage Site, you can visit as part of a guided tour, but make sure you book this in advance here. Although the city boats a new commercial airport, it is unlikely you could benefit at all from flying into the city. The amount of flights is so minimal, that does not make sense. However, “nearby” Burgos there are great airports at bigger cities with plenty of flights through Europe and beyond as is Bilbao and Santander at 160km in the north, Valladolid at 125km southwest, or Madrid 240km to the south. Coming by train from within Spain is very fast and reliable, and from the airports of the cities mentioned before is actually a short train ride. The new high-speed railway station is on the outskirts of the city. By bus is also possible to get to Burgos from most of Spain but will be much more time consuming, however, landscapes are very nice. Walking…if you are on the Saint Jame’s Way then Burgos is a major stop-over. The route coming from France passes direct through Burgos. Within the city there is no need to worry on how to move and transport around; it is very compact with an small-ish old town core mostly pedestrian therefore walking is your best bet. There is a good network of public buses through the urban core and the neighboring districts. If your hotel falls outside the city centre then buses will likely cover you towards the city centre. Finding a good deal was actually hard even if we came in low season. There are large numbers of tourists, mostly internal tourism from Spain, and hotels were very expensive. We had to go instead in this occasion for something not in the city centre but on the outskirts. Not a problem as we had a rental car, however, our choice did nor turn up to be a good experience. A good point to start your search is by checking some of our preferred affiliate hotel search engine such as Hotels.com, Booking.com, Expedia, Otel.com, Agoda, Opodo, LateRooms or Ebookers. We stayed at the Hotel Los Braseros, in Calle Severo Ochoa, 7, at the northeast outside of the historic old town. We chose this hotel on purpose on the outskirts as we had a car, so definitely there is nothing wrong to say about its location, we knew we will be using the car to get to the centre of the city and elsewhere. We wanted to have a relaxed weekend after pretty much exhausting ourselves sightseeing during the day, however this was not the case. The room was extremely outdated, not cared at all although they are refurbishing the rooms as we could see pretty newer ones. The bed was super uncomfortable and upon every move, the bedhead was touching the wall and making noise. That turned up into the room next to ours having “some fun” in the bed not once but 5 times. It was 4am until we started kicking very loud the walls for them to take notice. Not only they were absolutely careless about any other hotel guests, the walls of the hotel seem to be made of paper so you can hear every little thing. The shower was broken, half the water was running through the broken tube without reaching the shower-top. Staff was very nice and friend, and so was the breakfast, simple yet good. It could have been a good hotel, but it failed on the basis, providing a nice and relaxed rest, so we ended up pretty much deadly tired. If you have the choice then I would recommend to get another one, otherwise make sure to request a refurbished room. This entry was posted in 01. Europe, 09. October, 2016, Short Trips, Southern Europe, Spain and tagged Atapuerca, Burgos, Europe, Southern Europe, Spain. Bookmark the permalink. ¡Què bueno! Contundentes argumentos. Manten este liston es un blog genial. Tengo que leer màs articulos como este.